Piezoelectric devices are widely used as sources to generate sound waves or receivers to detect acoustic signals. In applications such as ultrasound imaging and nondestructive testing, the same transducer can be used as a transmitter to send a source signal and receiver to detect echoes. Modeling these devices often requires transient analyses with time of flight as output. Let’s discuss how to use the COMSOL Multiphysics® software to model a piezoelectric device as both a transmitter and receiver. 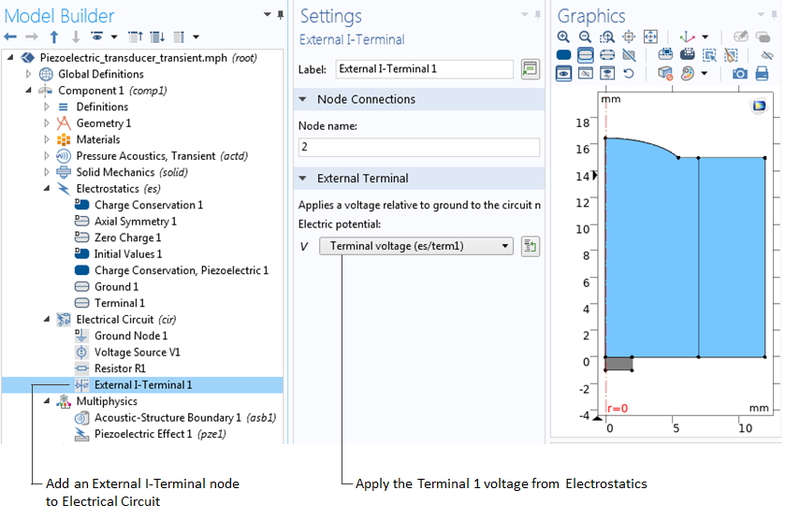 The best way to model a piezoelectric device that acts as both a transmitter and receiver is to connect the transducer to an external circuit using the Terminal feature. This is usually the situation in real-life applications in which a piezoelectric layer is sandwiched between two thin electrode layers so that it can be connected to a circuit. An additional benefit of the Terminal feature is that COMSOL Multiphysics calculates the available lumped parameters, which can be evaluated after the model is solved. A model of a sonic well logging setup with a piezoelectric transducer that transmits and receives sound. To demonstrate, we are going to set up a simple 2D axisymmetric model of a piezoelectric device. As illustrated in the figure below, a lead zirconate titanate (PZT-5H) disc of 2 mm in radius and 1 mm in thickness is used as a transducer. It sits in an infinitely large baffle and radiates a sound pulse to the water domain above. When the sound waves reach the rigid walls on the top, they are reflected back to the water domain and picked up by the transducer. The acoustic energy is both reflected back toward the receiver, but some is also transmitted out of the domain. This process will repeat many times before the acoustic energy is diminished by scattering or attenuation. The water domain is assumed to extend to infinity in the lateral direction, which is modeled using the Perfectly Matched Layer (PML) feature. The geometry of the model for demonstration. 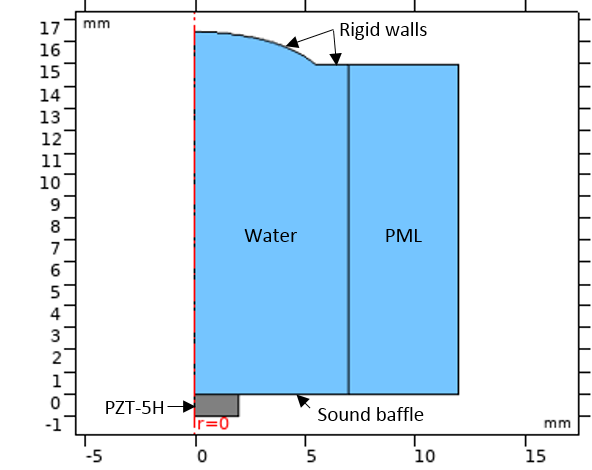 This scenario can be modeled using the Acoustic-Piezoelectric Interaction, Transient interface, a predefined multiphysics interface that combines the Pressure Acoustics, Transient and Piezoelectric Devices interfaces to couple the acoustic pressure variations in the fluids to the structural deformation in both the solids and piezoelectric solid domains. 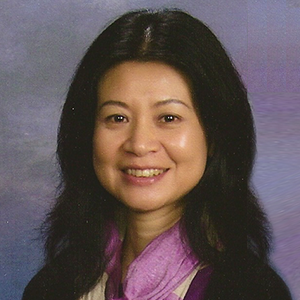 The Piezoelectric Devices interface is also a multiphysics interface. It combines the Solid Mechanics and Electrostatics interfaces together with the constitutive relationships required to model piezoelectricity. An electrical circuit is connected to a transducer to drive the device and receive signals. The excitation electrical pulse is shown on the right. Connecting the transducer to the electrical circuit using a Terminal feature. Below, the acoustic pressure is plotted at the centerpoint of the top surface of the transducer. The model is solved for up to 13 acoustic cycles to capture the first 2 echoes that reach the transducer. 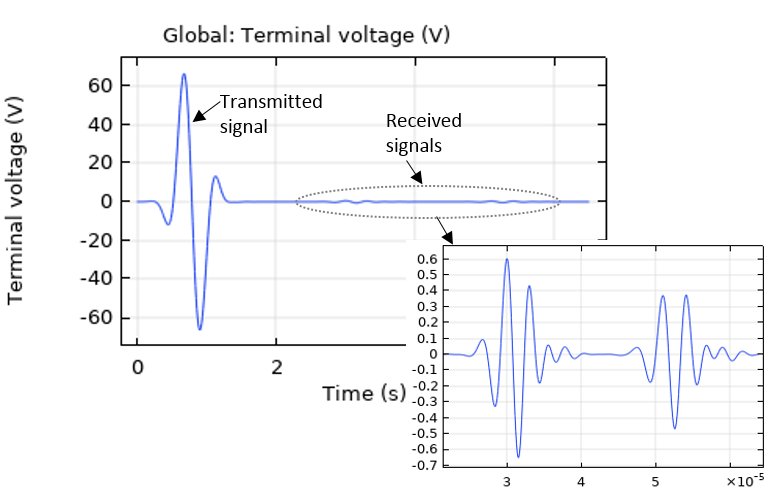 This information is also included in the terminal voltage received by the electric circuit, as shown in the bottom image below, where the signals from the first and second echoes are zoomed in for a better visualization. A plot of the acoustic pressure at the centerpoint of the top surface of the transducer. A plot of the terminal voltage that can be measured by the electrical circuit. If you do not have access to the Terminal feature, you can use the Surface Charge Density feature instead. Surface Charge Density is a boundary condition that can be added to the Electrostatics interface and applied to the electrode surface of the transducer. 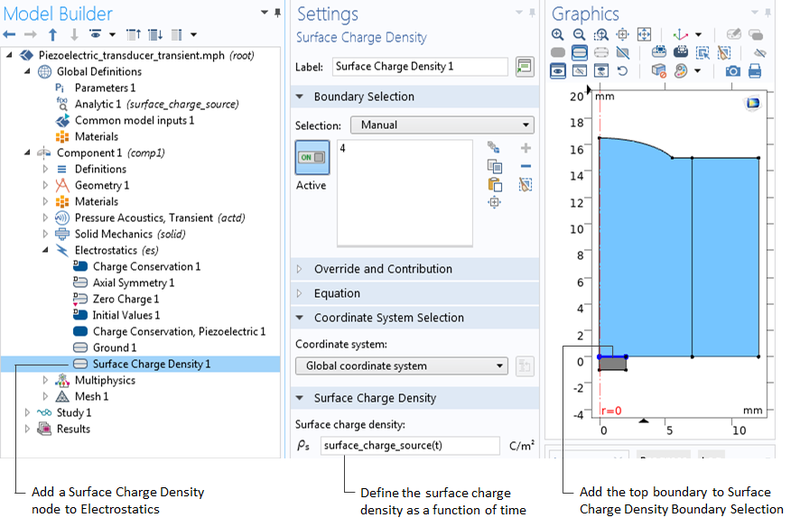 Using the Surface Charge Density feature to model the transducer. 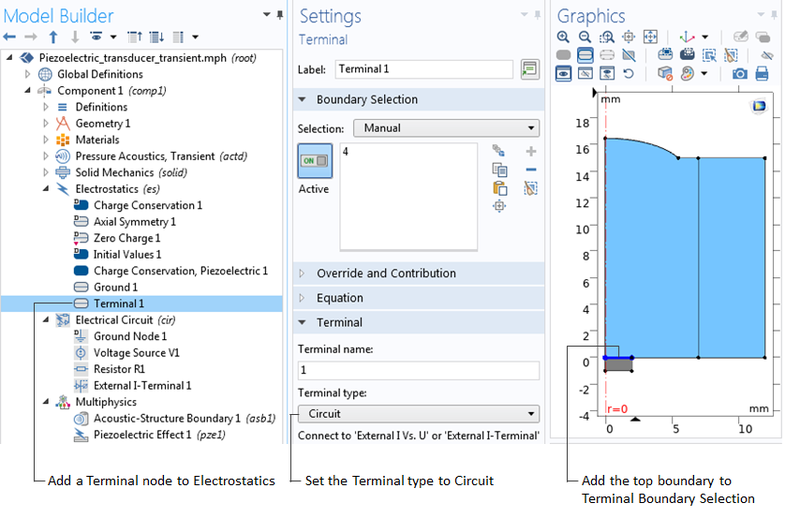 In general, you can use the Terminal feature or the Surface Charge Density feature to model a transducer as a transmitter, a receiver, or both at the same time. When a transducer is only used as a transmitter and you do not intend to use it to detect any incoming back signals, an Electric Potential node can also be used to specify the electric potential on the excitation surface. On the other hand, to model a transducer as a receiver only, a Floating Potential feature can be used as well. The Floating Potential node is used when modeling a metallic electrode at floating potential. When the charge is set to zero, the boundary will behave as an unconnected, neutrally charged, good conductor under electrostatic conditions. In the Sonic Well Logging tutorial model, you can use the Terminal feature with an electric circuit to model the transmitter, which is also used as a receiver. The other two receivers used in the model are simulated using the Floating Potential feature. 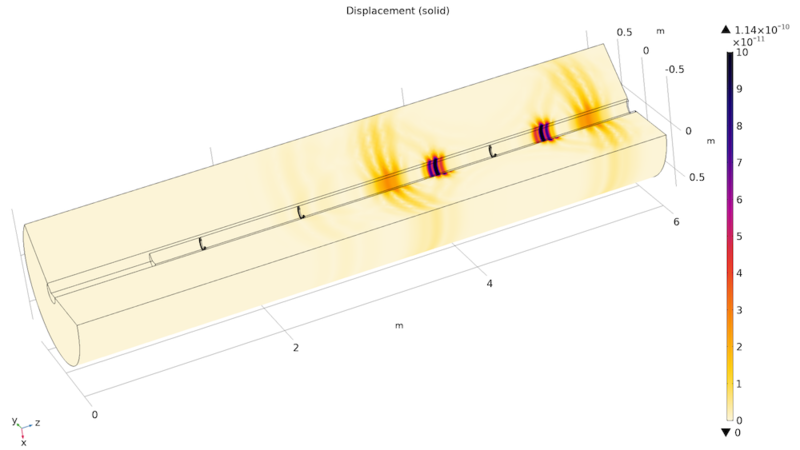 The model is actually available for download in the application gallery: https://www.comsol.com/model/modeling-piezoelectric-devices-as-both-transmitters-and-receivers-71111. It uses a time dependent study, and you can find the expression for the voltage source in the Electrical Circuit physics. Thank you for your response. That was really helpful for me especially by referring the model you gave. Sorry for disturbing but may I ask if the size of transducers is matters? If yes, may I know why?